Slightly time consuming, but so long as you can use a crayon, this one is incredibly easy. You can draw on paper and then transfer to the fabric via ironing, but the colours will be most vibrant if you draw directly on the fabric itself. So, put your jeans on a hard surface and have at it. 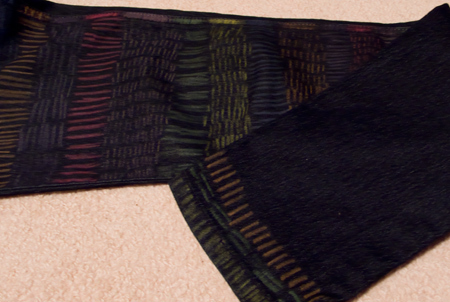 I used a variety of colours and just alternated between horizontal and vertical striping. When you’re done drawing, you’ll have to set the colour. With my Crayolas, this means placing a piece of paper over the pattern and ironing. 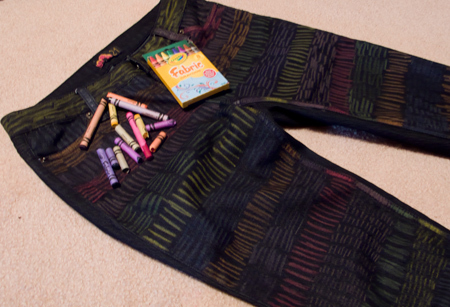 Each fabric crayon brand could have different requirements, so follow your directions. This is where I went wrong. My Crayola instructions state that the higher the polyester content of the fabric, the more colourfast the crayons will be. 78% cotton, and 20% polyester was just not a high enough poly count. When I put the iron on the colour, the pattern melted into the cotton! When I first lifted the iron I was baffled – what was this iron shaped dark spot? I recoloured the missing pattern and put the iron away. I’m going to try waxing over the pattern with Otter Wax, hopefully that will protect the print. Also, I’ll be sure the jeans undergo minimal washing. So, ta da – patterned jeans! When I started the pattern, I got halfway up the first leg front and considered stopping since it looked pretty cool just like that. But I figured it was my first project I may as well do the full front. I opted against doing the full back, and instead just went all the way around the ankle. There must be a fabric crayon for cotton – I’ll find it for the next one.